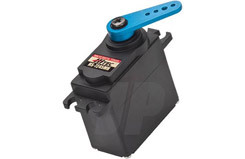 All Products > "2216574 HiTec HS7245MH HV Mini Digital Servo"
Watch out, here it comes! Our new high voltage, coreless HS-7245MH servo delivers exceptional speed and torque in a compact package. Built with an efficient coreless motor optimized for 7.4V operation and heavy-duty metal gear train with dual ball bearings, this high-end mini servo delivers unbridled performance just like its brother, the HS-7235MH.Whether you are flying mid-size gas and electric airplanes, 500-550 electric helis, or driving 1/12th scale on-road racers and 1/18th scale rock crawlers, the full-size muscle of this servo will make you the master of your RC domain.Exceeding Your Expectations Is What We Do! Speed: (6.0V/7.4V) - 0.13 / 0.11 sec @ 60 deg.